Sheared suspension of spheres occupying 52 percent of a volume, alongside images of "force chains;" i.e., the paths connecting spheres as they come into contact with their neighbors. 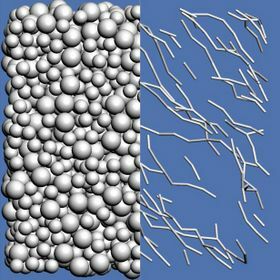 The top image shows the spheres sheared before the transition to discontinuous sheared thickened. An increase in the rate of shearing of just 50 percent puts the suspension above the transition to DST, as depicted by the dense network of connections. A new model by a team of researchers with The City College of New York’s Benjamin Levich Institute may shed new understanding on the phenomenon known as discontinuous shear thickening (DST), in which the resistance to stirring takes a sudden jump. Easily observed in a ‘kitchen experiment’ by mixing together equal amounts of cornstarch and water, DST occurs because concentrated suspensions of hard particles in a liquid respond differently than normal fluids to shear forces. For simple liquids, such as water or glycerin, resistance increases in proportion to the stirring speed. 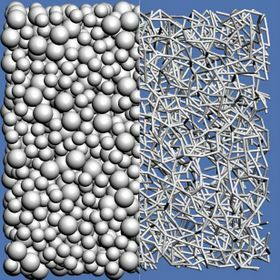 However, in complex fluids such as suspensions, emulsions and polymers the relationship is not proportional. Resistance increases either faster than the stirring speed – shear thickening – or slower – shear thinning. DST occurs when resistance increases suddenly. Research associates Ryohei Seto and Romain Mari and chemical engineering Professors Jeffrey Morris and Morton Denn set out to develop a model that would predict how resistance changes in relation to stirring speed. Their findings were reported in “Physical Review Letters” in November.